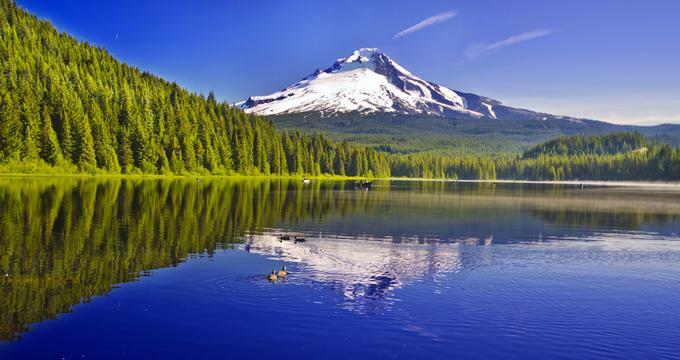 Oregon is an amazing place for a romantic weekend getaway, wedding or a longer vacation, home to Crater Lake National Park, famous vineyards in the Willamette Valley, romantic Portland, beautiful mountains, amusement parks, lakes, and coastal destinations. This is Part 2 of the article 50 Best Romantic Weekend Getaways in Oregon which highlights some of the most amazing inns, B&Bs, lodges and small hotels in the state. Surrounded by 35 acres of scenic vineyards in the heart of Oregon’s popular Willamette Valley, the Allison Inn and Spa offers the ideal setting for a romantic weekend escape. To set the scene for romance, couples can choose from the Wine and Romance Package, the Wine Rhapsody Package, the Date Night Package, or the Blissful Romance Package, each of which offers special treats and pampering. Many couples come to the valley to sample some of Oregon’s most exceptional wines, but there are also many other activities in the region, including horseback riding (and equestrian wine tours), helicopter flips, hot-air balloon excursions, hiking, biking, golfing, and gallery tours. 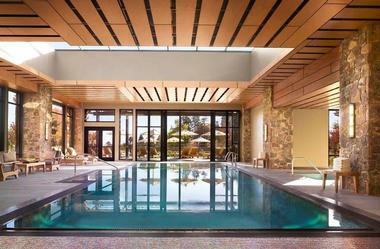 Back at the inn you can enjoy a spa treatment, visit the on-site art gallery, or simply relax by the indoor pool. Located inside a semi-private 18-hole award-winning golf resort, Tetherow is an upscale hotel on the slopes of Mount Bachelor, less than 4 miles from the Deschutes National Forest and about 4 miles from Bend. 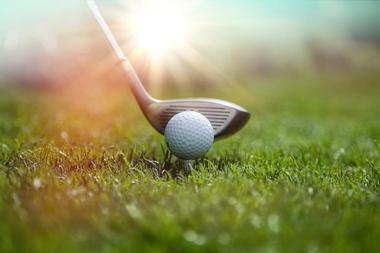 The resort includes a hotel, golf course, gourmet restaurants, and events venue. The rooms are modern and sophisticated, with fireplaces, 46-inch flat-screen TVs, and Wi-Fi, and some have balconies and sofas. Most rooms have spectacular views of the surrounding forest and mountain. Guests enjoy access to the 18-hole golf course, two restaurants, gear storage, a gym, and meeting facilities, and the resort’s free shuttle provides guests with easy access to Bend. 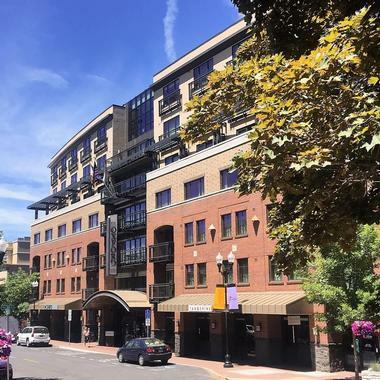 Located in historic downtown Bend, The Oxford Hotel is Bend’s only boutique hotel and proof that being eco-minded and powered by renewable energy can go hand in hand with the luxury and comfort that modern guests expect. Surrounded by the adventure opportunities provided by Mount Bachelor and nearby Tumalo Falls, The Oxford Hotel offers tired guests a cocoon of comfort and relaxation in their elegant, beautifully decorated, and comfortable rooms. All rooms have soaking tubs, organic pillows, free Wi-Fi, microwaves, mini-fridges, and flat-screen TVs. The suites and deluxe rooms also have kitchens and sitting areas or living rooms. The guests enjoy a sauna, a steam room, the use of laundry facilities, free bike rental, and modern event and meeting space. The restaurant 10 Below offers an elegant dining experience. Set on 1,800 acres in Powell Butte overlooking the Oregon high desert and with the backdrop of the majestic Cascade Mountains, Brasada is an upscale ranch resort about 20 miles from Bend. The resort accommodation consists of eight luxury cabins with private patios or balconies, spectacular mountain views, gas fireplaces, mini-fridges, Wi-Fi, coffeemakers, and flat-screen TVs. The cabins are beautifully decorated and have up to four bedrooms as well as fully equipped kitchens and living rooms. The resort guests have access to an 18-hole golf course and four restaurants ranging from gourmet to casual. Some are seasonal. 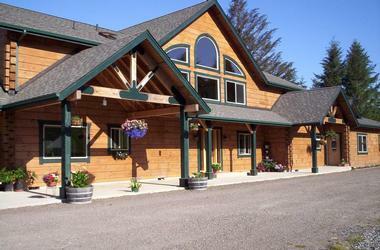 There is also a horse stable, a fitness center, outdoor and indoor pools, and a day spa. 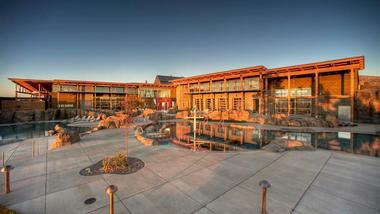 Brasada Ranch’s athletic center has two outdoor pools with a water slide, a waterfall, and a lazy river, a state-of-the-art gym, and two tennis courts. 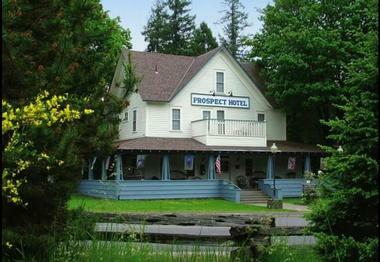 A short drive from Crater Lake National Park and even closer to Rogue River, Prospect Historic Hotel gives guest easy access to nearby natural attractions. There is also a modern hotel with wheelchair access on the same property. The ten rooms in the historic hotel each have their own theme and are named after historic people. They all have private baths and phones along with beautiful handmade quilts. You can choose a room with a double, full or queen bed and most also have at least a few antique accessories. In season, the hotel runs the Dinner House with its informal and elegant atmosphere. The dinner includes fresh baked bread and salads made using produce from the gardens. The dinner menu includes options for everyone, including appetizers, salads, pasta, pork, steak, chicken, lasagna and vegetarian options. Guests at the Wilson Ranches Retreat can have a relaxing ranch getaway or get involved in ranch life if they prefer. This 9,000 acre land is a working hay and cattle ranch with a 1910 historic Sears Roebuck Ranch House. There are six ranch-style guest rooms to stay in, sleeping up to six guests depending on the arrangement. Many units are air conditioned and all have hair dryers, deluxe cotton towels, premium bath amenities, alarm clocks and irons with ironing boards. There is also access to TVs with VCRs and the Dish Network, a movie library, games and books. The property also has a spacious dining area and living room and outside, you will find fruit and other trees along with animals grazing. While there, you can go horseback riding, hiking and birdwatching or simply take pictures and enjoy the wildlife. Access the guest refrigerator, BBQ grille and microwave or drink some coffee, tea, hot chocolate or apple cider. Guests are treated to a full family-style breakfast in the morning along with some great conversation. 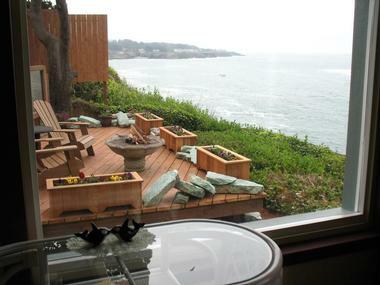 This bed and breakfast on the Oregon coastline is perfect for those looking for picturesque views since every room looks at the coastline. Each room also has its own private bath and a Native American theme and feature cozy chairs and queen size beds. The rooms have over 40 square feet of glass, giving unimpeded views of the water and horizon. 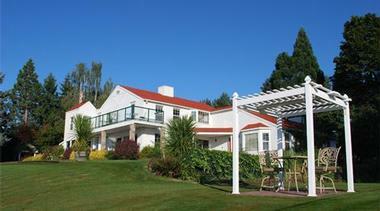 The lodge has rear gardens with great views of Sitka Spruce and the Pacific or areas for birdwatching. Follow the short private path to enjoy miles of tide pools and beach. The grounds also have an outdoor fire pit and plenty of areas to explore. There is wireless Internet on-site and you can schedule an appointment with a licensed massage therapist. Breakfast is served every morning as a family-style affair with fresh fruit or fruit-based dishes and a warm dish along with fruit juice, coffee, tea and hot chocolate. Any time of the day, you can enjoy the complimentary wine and beverage bar or get some homemade cookies or popcorn during the afternoon. The Georgian House is a historic bed and breakfast that is one of only three Georgian colonial homes remaining in Portland. The home dates back to 1922 and has been restored to include leaded glass windows, a winding staircase and other historic elements. Guests have access to air conditioning, phones, free wireless Internet, and TVs with VCRs. There are two rooms and two suites to stay in, each with a slightly different style. Some rooms have fireplaces, dressing tables, bookcases, window seats, French windows, claw foot soaking tubs, private verandahs and private or shared bathrooms. Most rooms accommodate two people, but the suites can fit four. Guests are transported back in time when they climb the winding staircase up to the rooms. There is also a fireplace and sun porch to help with relaxation. The outdoor gardens have been featured in magazines and include a deck and gazebo. 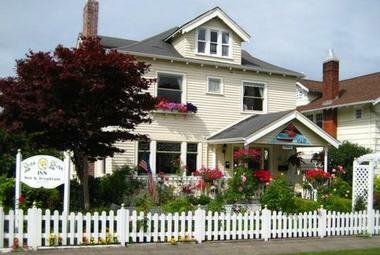 The SeaQuest Inn is a bed and breakfast on four acres along the oceanfront, giving guests dramatic views. The inn features glass and cedar and the guest rooms have gorgeous ocean views, personal decks, private entrances and en suite baths featuring Jacuzzi tubs. The entire building has wireless Internet and all rooms have full baths, hair dryers and bath amenities. Guests can relax in the great room with its fireplace, which is also where breakfast is served. The wrap-around balcony is perfect for whale watching and guests can walk along the beach to take in the sand and tide pools in more detail. This upscale bed and breakfast sits in a Rogue Valley Orchard Mansion that is part of the National Register of Historic Places. Each guest room is large with its own private bathroom, fluffy towels, crisp linens, personal robes, down comforters, antique furniture, oriental carpeting, fine artwork, phones with data ports, TVs with VCRs and DVD players and wireless Internet service. Guests also get free access to premium channels. The five acre estate includes lush gardens and beautiful views along with various paths to explore. There are also two idyllic ponds and a range of flowers. Other outdoor amenities include a private croquet court, a tennis court, a running track and an in-ground pool. Guests can attend classes at the Willows Cooking School which is right in the Carriage House. The morning begins with a breakfast featuring local fresh ingredients for fresh baked pastries and the entrees. If you have a group of 10 or more, you can arrange a dinner on-site as well. 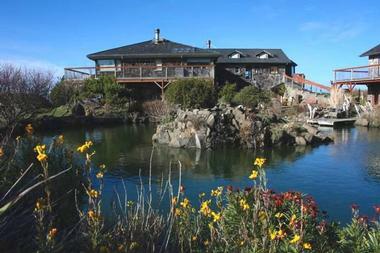 The Salmonberry Inn & Beach House gives guests the chance to stay right by the rugged Oregon Coast. Relaxation is key so every guest room has down comforters, plush robes, fresh flowers, antique queen beds, sitting areas featuring comfortable chairs, wireless Internet, TVs with DVD players, and private bathrooms with beautiful tiles. During your down time, you can walk along the sandy beach, take advantage of the hot tub or warm up by the fireplace. There is also a communal sun deck and various common areas plus private spaces throughout. There are also numerous nearby activities, including fishing, hiking, crabbing and shopping. Every morning, guests can choose between several breakfast options, such as chocolate Paninis, biscuits and gravy, eggs benedict and blueberry pancakes with bacon. There are even gluten-free options. There are also coffee-house-quality espresso drinks available and the chance to hire a private chef for a night. The Whales Rendezvous is correctly named since it is the perfect place for whale watching during the proper time of the year, and the rest of the year you can watch the waves crashing. There are two elegant suites, each with their own private outdoor entrances and large private outdoor areas with fire pits. The Ocean Garden Suite has a private outdoor fireplace, garden and deck, and a tiled whirlpool jet tub and shower combination. The Sea Rose Suite also has a wood fireplace and its private bathroom has a large walk-in shower with room for two. Both rooms have wireless Internet, queen beds, coffeemakers, separate sinks, microwaves, toasters, fridges, hair dryers, phones, Dish TVs with DVD players and an extensive movie collection. There are plates, wine glasses, silverware and more for guests to use. The Bed and Breakfast Package is the perfect way to get a delicious hot breakfast brought to your room. There are also packages without breakfast or housekeeping if you prefer to feel like you are at home. Visiting Youngberg Hill gives guests a chance to enjoy a relaxing stay at an inn while enjoying everything wine country has to offer. Guests can stay in one of four king suites or four queen guest rooms. Each has comfortable chairs and private en suite baths. The entire house has central air conditioning and heating. Room amenities include wireless Internet, MP3 docks on alarms, irons with ironing boards, blow dryers, luggage racks and spa robes. Some also have Jacuzzis or two-person double showers. Guests are welcome to relax in the lounging salon, dining room, library or covered decks. Its location on top of a 50 acre hilltop gives guests gorgeous views of the surrounding organic vineyard and the rest of wine country. The on-site vineyard is 25 years old and organically farmed; it is known for award-winning Pinot Gris and Pinot Noir which you can enjoy in the tasting room. Guests get daily complimentary wine tastings in the afternoon. In addition to parking, there is charging for Electric Vehicles. The two-course gourmet breakfast features regional foods and a rotating menu with items like homemade granola with yogurt, salmon hash, Cornish baked eggs with honey baked bacon and pancetta tarts. With its location just south of Cannon Beach, the Ocean Point Inn gives guests easy access to nearby activities and attractions. Every room has a private entrance, private bath with an enclosed wet area and dual rain shower, Bose SoundDock digital music system, wireless Internet, spa robes, fireplaces, down comforters, Nespresso coffee brewers, microwaves and fridges. You can enjoy a bonfire by the beach or a massage at the Ocean Point Spa. The inn is just a few steps away from the ocean so you don’t even have to plan. If you don’t want to sit right next to the fire, hang out in one of the Adirondack chairs or sit nearby on the deck or lawn area to watch the fire from afar. There is a complimentary breakfast daily with the option of having it in your room or enjoying it outside on the patio facing the ocean. It includes a savory egg dish, muesli, an Artisan breakfast board, tea, coffee, juice and other local ingredients. With advance notice, the inn can accommodate special diets. The Powder Creek Ranch has more than 360 acres of land for guests to explore and relax in. There are two suites to choose from with Eastlake Suite covering more than 600 square feet. It has a private deck and entry, queen size convertible bed and normal queen size bed, granite fireplace, private dining, gorgeous views, wireless Internet, a DVD library, TV with DVD player and a soaking tub. The Heritage Suite sits on the second floor and is slightly smaller at 400 square feet with its own private deck, king size bed, a sunny dormer, TV with DVD player, large bathroom and wireless Internet. The surrounding forest and frontage on the Nestucca River provide all sorts of outdoor recreation from hikes and wildlife watching to fishing. There is even a waterfall trail running through the forest. 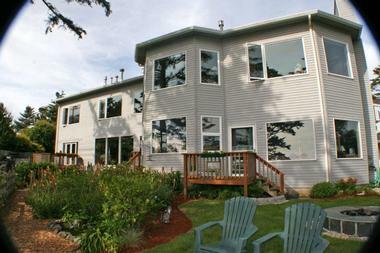 It is just a short drive to enjoy beach activities or nearby lighthouses and other attractions. The daily breakfast is made from as much organic, natural food as possible, including items from the garden, fresh eggs from the hens and grass-fed pork. They can accommodate dietary restrictions with notice as well and you can even opt to enjoy a family style dinner with dessert and multiple courses. Within the Willamette Valley, the Carlton Inn is the former 1915 family home of a lumber baron within easy walking distance of wineries, tasting rooms, restaurants and shops. There are four guestrooms with private baths and a choice of either queen or king size beds. The rooms all have fluffy towels, micro-fiber sheets, comforters, hypo-allergenic slip covers on the towels and power strips. Some rooms also have fir flooring, loveseats, chandeliers and twin size daybeds. The living room has a wood-burning fireplace, comfortable seating and a TV area. Guests can also enjoy the back porch that overlooks the back garden and has plenty of shade. The multi-course breakfast is included in your stay and made from scratch with local ingredients, including produce from the on-site gardens. Breakfast typically includes a fresh baked good, fresh fruit, yogurt with granola and a hot entry or the option of breakfast to go. When you check in, you will get to enjoy fresh baked cookies. 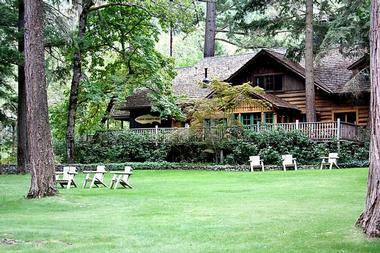 The Weasku Inn was built in 1924 and served as a fishing lodge with easy access to the Rogue River. The inn has a range of accommodations, including 5 lodge rooms, an A-frame cabin, 11 river front cabins, and a 3-bedroom river house. The river cabins have flat screen TVs, mini fridges and coffeemakers while some also have king or queen beds with pillow tops, sitting areas, semi-private decks with a roof and a gas fireplace. Lodge rooms may have king or queen beds, Jacuzzi tubs, sitting areas, coffeemakers, flat screen TVs, sitting rooms, balconies, sleeper sofas, chaise lounges, desks, and/or wet bars. One of the river cabins is also ADA compliant. 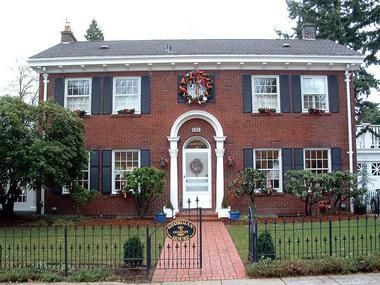 This bed and breakfast is in a 1906 Queen Anne Mansion that is part of the National Register of Historic Places. 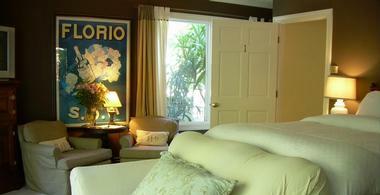 Each of the eight guest rooms has a private bath and Victorian charm mixed with modern amenities. Expect to find air conditioning, high-speed wireless Internet, phones and cable TV. Depending on the room you choose, you can also enjoy a sitting area and table, large bay window, fireplace, flat screen TV, modern soaking tub, electric fireplace, walk in shower, and/or writing desk. The Victorian Apartment is larger with one or two bedrooms, a large bath, a kitchenette and dining area, a TV with DVD player and electric fireplace with antique mantle. During the day, guests can relax in the gazebo, garden court, Victorian parlors, grand Dining Room and old-fashioned warp-around porch. There is also a free guest computer with a printer and multiple specialty maps to help guests find destinations. The daily breakfast has fruit, pastries, hot egg dishes, breakfast meats and/or side dishes, tea, coffee and orange juice. At any time, you can enjoy pretzels, candy or cookies at Grandma’s Treat Table. The building of this bed and breakfast is 100 years old and just three blocks away from Historical Downtown. The 1912 home has five guest rooms for you to choose from. 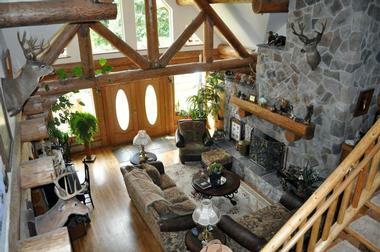 Each one has a gas or electric fireplace and you can even choose a room with a river view. Depending on the room, guests can get a claw foot bath tub, private sun porch, an extra room, queen or king bed and sitting area. 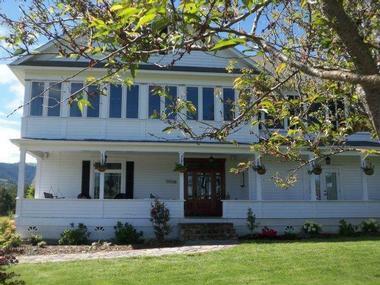 The bed and breakfast has a front porch and back deck with river views for relaxation. The daily full breakfast of fruit, a main dish, plus dessert is served at 8:30 am in the dining room that looks over the Columbia River and there is wireless Internet throughout. You can also enjoy cookies, hot chocolate, tea and coffee before breakfast. The inn is within an easy walk of various restaurants, galleries, shops and outdoor activities like swimming, biking, hiking, clamming, golfing and fishing. The Cornerstone Bed and Breakfast is in the middle of the Willamette Wine Country in a relaxing town with easy access to downtown Portland. Each of the three guest rooms has its own unique style so guests can pick from the Rose Room, Coastal Room or Oregon Trail Room. The rooms all feature high quality mattresses, luxurious sheets, high-end bath amenities, a television and high-speed wireless Internet. Some rooms also have larger tub and shower combinations, a shower seat in a large shower, or are ADA accessible. The Oregon Trail Room can accommodate those in wheelchairs. Depending on the room you choose, you will get two twins, a queen or a king bed. The inn also has a comfortable library with a fireplace that is perfect for relaxation or borrowing a book. The covered deck covers three sides of the house and the exterior also features vegetable and flower gardens. Guests can enhance their stay with the Romance Package that adds sparkling cider or wine, roses, chocolate and more. The Forest Springs Bed & Breakfast is in the center of the Gresham Buttes surrounded by 2.5 acres of wooded land right next to over 2,000 acres worth of protected forest. The home dates back to 1908 and features leaded glass windows, period furniture and other historic themes mixed with modern amenities. There are two guest rooms, each of which is upstairs and has its own bathroom with a hair dryer. You can choose appropriately to have a window seat, old-fashioned bathtub with a claw foot and handheld shower, and/or walk-in closet. Guests share a sunroom featuring a TV, DVDs, puzzles, games, two full walls with windows and a writing table along with comfortable seating. The grounds have a range of trees to explore and the day begins with a full course breakfast. Breakfast includes tea, coffee, juice and a hot entrée such as frittatas, pancakes, omelets, bacon, fruit compote on waffles and more. The Mt. Emily Ranch Bed and Breakfast has a rustic vibe thanks to its log home featuring large picture windows and vaulted ceilings. Every guest room has heating and air conditioning, a fireplace, a ceiling fan and memory foam mattress toppers. The large loft shared by guests has a kitchenette along with a mini fridge, coffee and tea. There are a total of two spacious rooms and one suite. Guests get amazing views of the surrounding Chetco River Valley from most directions and you will see wildlife like wild turkey, elk and deer walking around the area. Guests have access to spacious sitting areas, wireless Internet and free satellite TV. With 135 acres of land, the ranch offers enough space for guests to explore. While there, you can simply relax and watch birds or enjoy the scenery. You can help out in the garden, feed the animals, pick apples, make some apple cider, or even help with the farm animals. There is always a hearty breakfast in the morning and the bed and breakfast can accommodate dietary restrictions with notice. 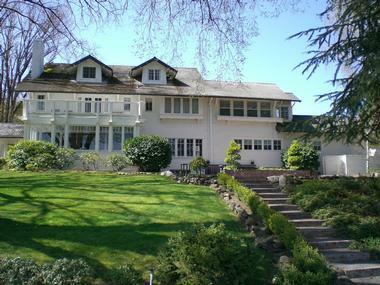 This elegant historic home is green and close to plenty of wineries as well as Crater Lake. All rooms come with fresh flowers, hair dryers, a CD player and radio, a television with VCR and DVD player, local soaps and luxurious robes. Guests also have access to the guest refrigerator, hot tub and fireplaces. The 1909 farmhouse is surrounded by local waterfalls and a Christmas tree farm, providing plenty of activities. On-site, you can bird watch, look at the stars or enjoy the hot tub. The breakfast includes fruit and vegetables that were grown right in the inn’s organic garden and they do their best to use other local organic products. The Brenner Suite can accommodate pets and children of all ages, but only those 10 years or older can stay in the main house. Complimentary treats include local toffee and chocolate, local wine, beer, water, soda and ice cream bars. Breakfast is complimentary and you can eat on the front porch, back deck, dining room or somewhere else. 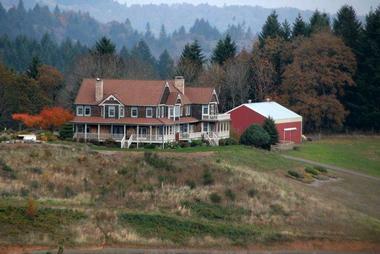 The Wine Country Farm is both an inn and a vineyard, giving you amazing views of the surrounding wine country. The building dates back to 1910 and includes nine rooms and suites as well as a separate guest house. All rooms have bathrobes, bath amenities, hair dryers, private baths, down comforters and wireless Internet. You can also choose a room with a bathtub, TV with DVD player, deck, hide-a-bed, handicap accessibility, private entrance, bistro table and reading chairs. The Seal Rock Beach House has its own kitchen area, large deck, two bedrooms, a living area and even a garage and laundry area. During their stay, guests can relax in the hot tub, watch some movies, go for a hike or just read a book next to the fire. It is a working farm with Arabian horses and grapes so you can watch some of the daily tasks. There is also a wine tasting room that belongs to the inn itself and beautiful surrounding gardens. You can even take a horseback wine tour. 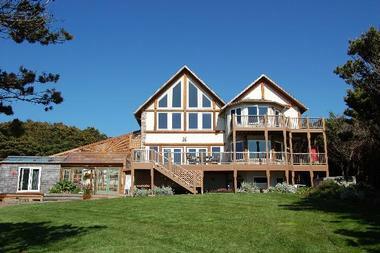 Wheeler on the Bay gives guests mountain views which are reflected in Nehalem Bay. Every room at the inn has a fireplace, refrigerator, microwave, full-sized coffee maker and TV with DVD player. There are 12 rooms and suites, including the Captain’s Quarters which has room for up to 10 people, making it perfect for families. Some rooms also have personal decks, futons, views of the bay, cozy chairs, BBQs, deep spa tubs, jetted tubs, floor-to-ceiling windows or dining tables and chairs. Guests can simply relax and watch wildlife in the designated viewing area. 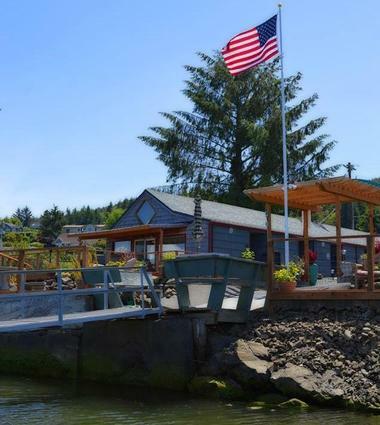 The inn’s location also provides easy access to fishing, kayaking, shopping and antiquing. The property has free wireless Internet and a library of over 1,000 movies. There are also complimentary snacks, tea and coffee. All rooms have coffeemakers and guests can enjoy a free breakfast in the morning. The Enterprise House is on the National Registry of Historic Homes and gives guests a great way to enjoy the natural beauty and fresh air of Wallowa County. There are five rooms and suites to choose from with slightly different amenities in each. Guests can enjoy bronze towel racks, Sealy Posturepedic mattresses, extra-large showers, claw foot bath tubs, king size beds, or rooms that can fit up to six people. All rooms have private baths and wireless Internet along with air conditioning. 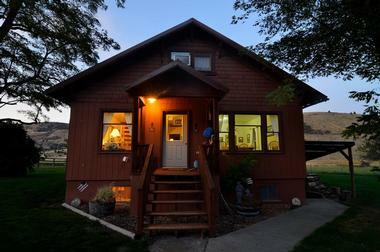 Guests can swim in Wallowa Lake or go for a walk or bike ride through the relaxing area. The living room has leather couches, reading lamps, bookshelves with books and a fireplace along with wireless Internet. You can even bring your horse along to the Enterprise House if you make arrangements ahead of time. The innkeepers can accommodate dietary restrictions with notice and breakfast dishes may include treats like berry French toast with granola and scones.